There are few things that make me feel as at peace as running water. 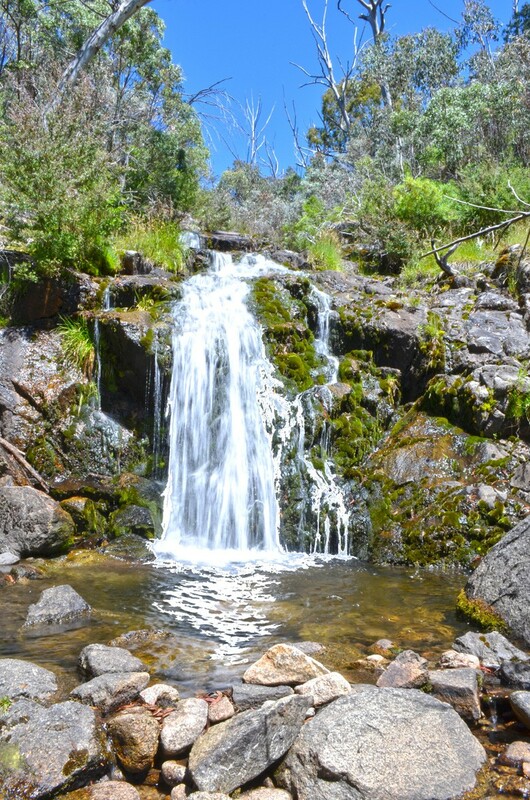 I’m sitting on a granite slab in the sunshine, at the foot of the unnamed waterfall which is the focal point of the Kosciuszko Waterfall Walk. On the way here, Lori and I both remarked how noisy this forest is. There’s a seemingly endless cycle of whip bird calls, the screeches, twips and chatters of the 200 or so other bird species, and the constant high-pitched chirp of the cicadas. It’s incredibly beautiful. But sitting right beside this tumbling cascade, the water bounces off every surface, making every conceivable sound. It’s not only loud but covers virtually every audible frequency. I’m left with nothing but white noise. I reflect on how easy this makes it to switch off my brain, and to focus on my breathing. I can’t remember feeling this relaxed for a long time. As a parent of young kids, this feeling can only be described as unusual. It’s actually a little unnerving, but I savour it. I definitely need a waterfall at home. 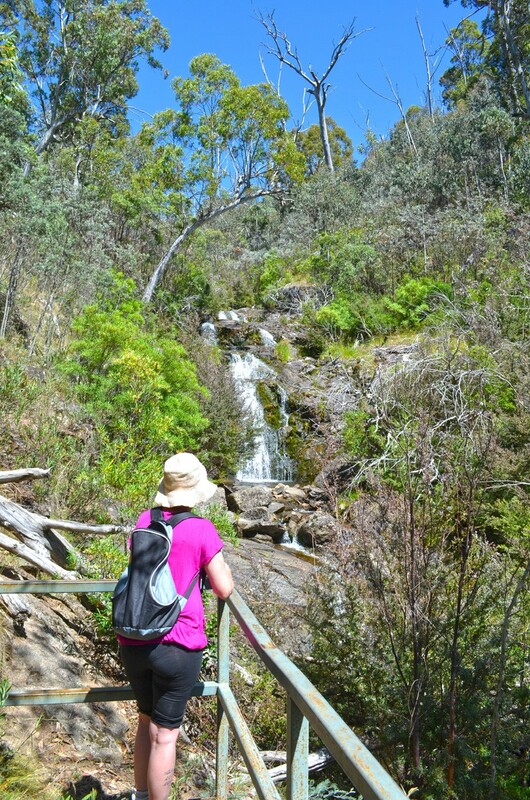 We leave behind the waterfall and the stand of Alpine Ash surrounding it to continue the circuit walk back to the car. It’s a little disappointing to head away from what I’ve assumed will be the most beautiful part of the hike, but it isn’t long before my assumptions are proven wrong. The track winds its way along the north side of the valley before crossing back over Sawpit Creek, and we come to a massive outcrop of granite boulders. They’re a feature just as worthy as the waterfall. We stop to admire them and take a few photos, but just as we’re ready to continue we hear a noise. We scan the thick vegetation and quickly notice a group of Grey kangaroos bounding away, spooked by our presence. Resigned to the fact that we’ve seen the best of this hike, we’re surprised when we come across another outcrop that’s even more spectacular. 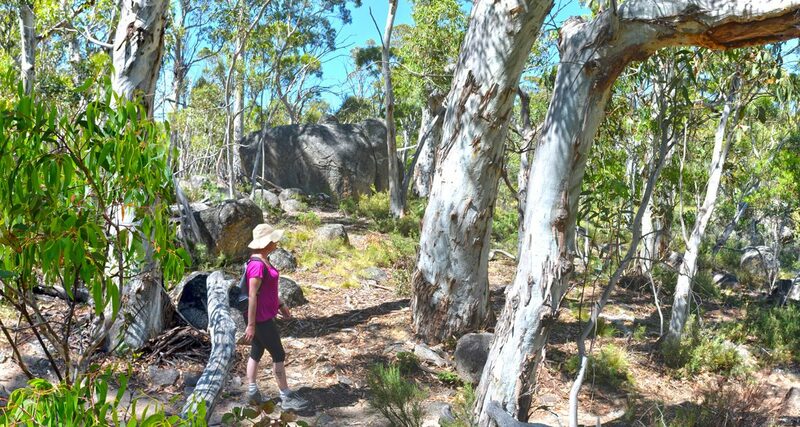 We follow the track between these boulders, pausing every couple of minutes to admire them. “This place is like a labyrinth,” Lori remarks. We take our time through this short section of the track, letting out a chorus of “wow” at every turn. A little further on, with no granite in sight, we reach a more open section of heathland. The track gets narrower and is surrounded by long native grass. I take the lead for a few minutes, but then I get the urge to relieve myself. Lori keeps walking but as I finish doing my business, I hear a rustling sound and scan the undergrowth around me. “What? Really? Where?” Lori yells. By the time she retraces her steps to me, I’ve realised it’s nothing dangerous and I’m just enjoying watching the beautiful creature. It’s a white-lipped snake, searching the undergrowth for its staple diet of small lizards. We’ve seen heaps of tiny skinks scurrying back and forth along the track in front of us so I can see why these snakes are a common sight here. Our excited chatter scares it under a rock, so it’s time to keep walking again. It’s not long before we’re back at the Sawpit Creek Picnic Area, where Henry (our car – yes, we’ve named our car) and the very long drive to the Blue Mountains await us. Map: So far, I haven’t found a map that covers this area. Let me know if you’re aware of one. I did the hike without a map and, considering there are no track intersections and the circuit is very easy to follow, you should be okay if you stay on track. Access: Head west from Jindabyne on Kosciuszko Road. 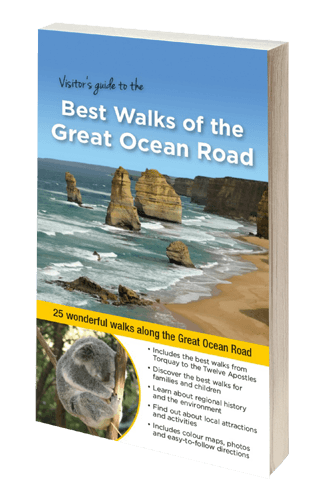 This walk starts from the Sawpit Creek Picnic Area, which will be on your left, about a kilometre past the NPWS pay station. Look for signs for Sawpit Creek or “Kosciuszko Mountain Retreat”. Park in the picnic area and follow the creek to an underpass at Kosciuszko Road. This is the trailhead and it’s easy to follow the signs from there. 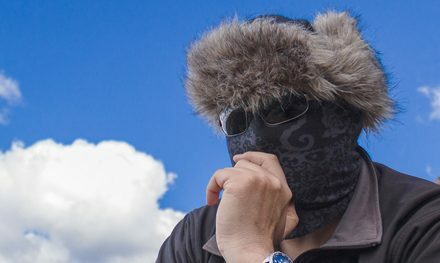 Further info: The track could potentially be snowbound between June and October. Park Entry Fees apply. 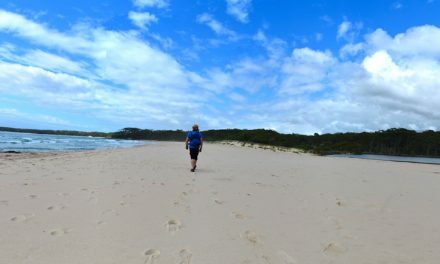 See the NPWS website for pricing and access information. Lori looks around us at the young teenagers and parents with little kids we’re surrounded by. I agree, but then naturally we both turn to guilt at the fact the kids aren’t here with us. “The Chop and The Fairy Princess would absolutely LOVE this,” Lori exclaims. We’re in line for the Thredbo Bobsled, having found ourselves free for a couple of hours post-summit hike. We’ve got four rides each on our ticket and we’re intent on using them all. And then going to the pub, because we’re kidults. We only have to wait in line for ten minutes or so (although signs in the line indicate that it can often be much more than that) and we’re saddling up to start the ascent to the highest point of the bobsled track. We both feel old as we strain to lean forward and keep our brakes in the off position as the pulley drags us up the steep hill. “Jamaica, we have a bobsled team,” I sing as we start to pick up speed on the descent. Within a minute I’m absolutely flying down the bobsled track. I’m going so fast that on the corners I feel like I’m horizontal, but it never feels unsafe. After a few corners I hit the brakes, scared of rear-ending the teenager who took off in front of me, but as I reach the end of the track I make a mental note not to bother next time since there’s never another rider in sight. I hop off my luge and wait for Lori to finish, and when she comes sliding in I watch her face and try to gauge how much she enjoyed herself. “Soooo… Should we go again?” I ask. Within a few seconds, we’ve joined the line again. We wait, comparing stories. After three goes each, we’ve had our fill, but if we had time on another day we’d definitely go again. 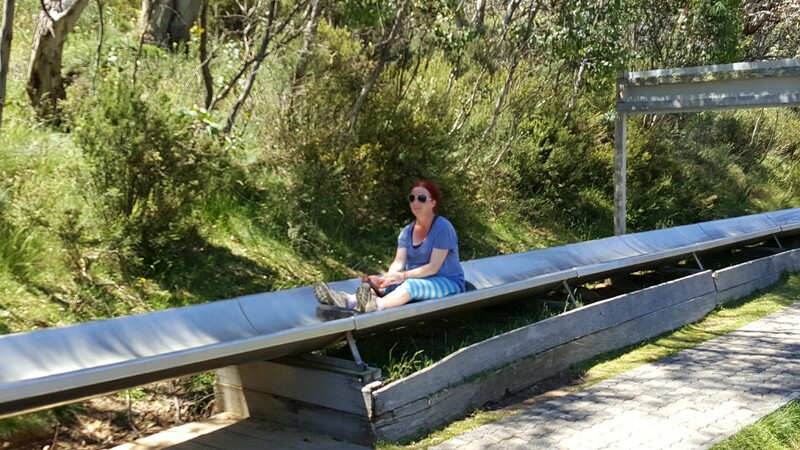 You must be at least 9 years old and more than 130 cm tall to ride the Thredbo Bobsled, but kids who don’t fit the bill can double up with an adult. It’s open from 10 am to 4 pm, seven days a week, weather permitting. At the time of writing, tickets start from $7 for one ride through to $90 for 20 rides. Check out the Thredbo website for up to date pricing. The moonlight reflects off the Snowgums that surround the Thredbo River, making their trunks glow almost like street lights. The river babbles away, creating the perfect soundtrack for our late-night stroll. It seems our favourite place at Thredbo is the Thredbo Hotel, we spend hours playing pool and sitting on the deck, admiring the views, absorbing the sunshine and drinking the delicious local brew – Kosciuszko Pale Ale. Of a night time, when we’ve had enough of the pub, we get restless and end up spending our nights here, just walking and chatting by the river. There’s nothing I love more than being in nature with the love of my life. It makes us both light up. 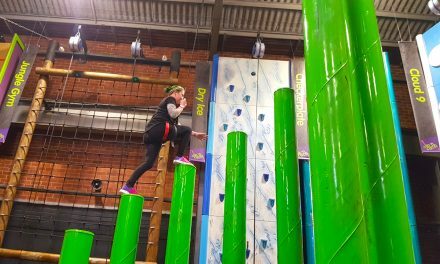 Aside from the obviously stunning setting and the abundance of adventurous activities, Thredbo Village itself is an incredibly beautiful place to spend some time. Even in summer, Thredbo has an excellent vibe with cafes, restaurants and bakeries open and full of customers enjoying delicious food and drinks, and soaking up the sunshine. We wish we could spend more time here. Having never stayed in a ski lodge before visiting Boali Lodge, I’ve got no idea what to expect. I’m still not sure if it’s a typical ski lodge, but when we arrive it’s immediately apparent that this is unlike most accommodation I’ve experienced before. We arrive just before dinner time and on seeing the menu, I get my first clue that this place is out of the ordinary. We’re being treated to a three-course meal from the chef/manager, Carolyn Major, and all three courses sound incredible. Boali is very focused on socialising with other visitors, so we sit down at a table where our dinner companions have set our places next to theirs (Boali has a roster for setting dinner places and all guests are expected to contribute). We enjoy great conversation with another like-minded couple and share our BYO alcohol while we chow down on some of the best food I’ve ever eaten. After dinner we retreat to our basic but clean, well-designed and well-equipped room (with ensuite) and get ready for the short walk to the Thredbo Hotel for a few Mount Kosciuszko Pale Ales, to top off another great night of our precious, kid-free school holidays. When we wake in the morning we’re treated to bacon and eggs for breakfast (with optional fruit and cereal). While we eat, Carolyn prepares a platter of cold meats, chopped salad vegies, antipasto and condiments, so that we can make ourselves a packed lunch for our day’s hiking. There’s even muffins and fruit we can take with us. Did I mention that this place is only about 100 metres from the Kosciuszko Express Chairlift? 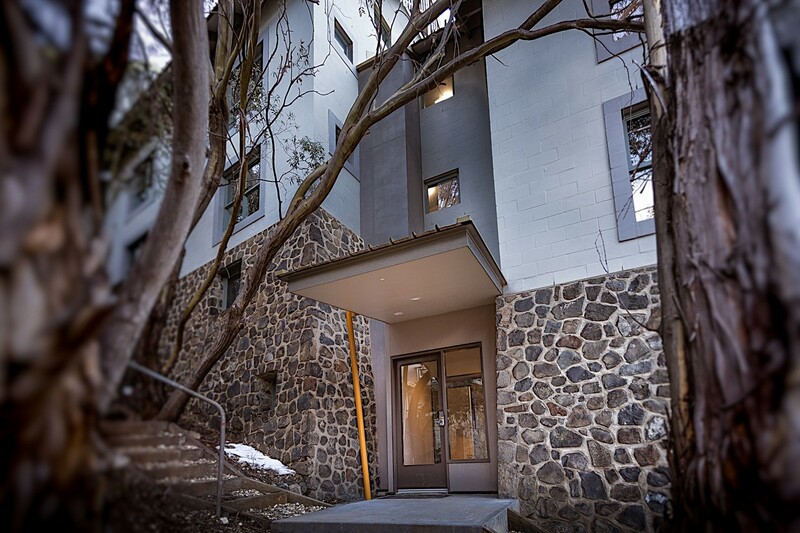 It’s the perfect spot for a stay in Thredbo, whether in summer or winter. Boali Lodge has 14 rooms (all with ensuite) that are suitable for couples, families or friends. Prices vary depending on your required room configuration, the ages of your children, and the season. Check the bookings page on the Boali Lodge website for full details. The Lodge is also equipped with a luggage lift, laundry, TV room, sauna, secure storage for ski equipment or mountain bikes, a relaxing lounge room and balcony with spectacular views across Thredbo Village to the surrounding mountains. 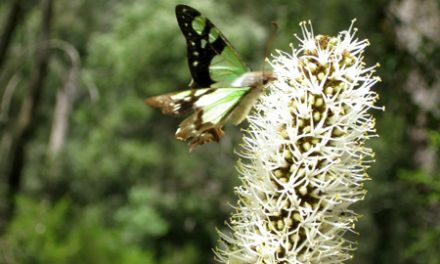 Have you visited Mount Kosciuszko National Park and Thredbo Village? Got it on your bucket list? If you have any stories, updates or corrections, please let us know by commenting below.